OK, New York is not a beautiful city in the sense of the traditional song (Dave Van Ronk sings “Oh, What a Beautiful City!” here), but that spiritual has been playing in my head today because I really like New York. It’s definitely not a clean city. Every day of the week there are so many trash bags on the sidewalk that the garbage trucks often leave half behind for a later pass, and not-civic-minded New Yorkers toss last night’s take-out on the heap as they walk their children to school. Speaking of clean, Asakiyume once pointed out that the business that attracts almost as much creative naming as beauty salons is the porta-potty business, so the first photo below is for her collection. Next I have two indoor photos, followed by several from beautiful Central Park. Having been warned never to go near the park when I walked the Corgi in the morning decades ago, I’m always astonished that today one can walk there early in the morning and join many other people — runners, bikers, dog walkers, children headed to school, sometimes a solitary practitioner of tai chi chuan. I love the shadows at that time of day and the greenery, the park’s architectural touches, the benches with thoughtful quotes, the paths that beckon. It’s pretty magical. Riffing off a Lawrence Block quote, another kiosk asked what was “the thing about New York, if you loved it, if it worked for you, it ruined you for anyplace else in the world”? New York doesn’t ruin anywhere for me, but I feel challenged to answer what is the main thing I like about New York: it’s just that it’s always interesting. A design by Meredith Bergmann of suffragists Elizabeth C. Stanton and Susan B. Anthony, the first Central Park statue depicting real women. Other than fictional characters like Alice in Wonderland, females have not been represented among Central Park’s statues. A new sculpture, of suffragists Elizabeth C. Stanton and Susan B. Anthony, is the first step in changing the all-male array of historical figures in the park. Nadja Sayej reports at the Guardian, “In 1995, the artist Meredith Bergmann was working on a film set in Central Park when she noticed something was off. “There are only five public statues of real women in New York City (excluding fictional characters like Alice in Wonderland and Mother Goose), while there are 145 sculptures of men, including statues of William Shakespeare and Ludwig van Beethoven, who are both in Central Park. “[Says] Elam, ‘Women’s history is such a treasure chest of inspirational stories, it gives us courage to keep fighting for women’s rights and achieve equality in our lives. We want to get their stories out there for people to be energized by their contributions.’ ” More at the Guardian, here. I’m in New York this week to be with my sister as she winds up six weeks of radiation and chemo. If I see any statues of women, I’ll be sure to share a picture. John sent me the picture below of a corn maze designed to look like a scene from Alice in Wonderland. It got me thinking about Alice’s other outdoor appearances, like the Mad Tea Party topiary at Disney or the statue in Central Park, New York City. “Created by the Spanish-born American sculptor José de Creeft, the piece depicts Alice holding court from her perch on the mushroom. The host of the story’s tea party is the Mad Hatter, a caricature of George Delacorte. The White Rabbit is depicted holding his pocket watch, and a timid dormouse nibbles a treat at Alice’s feet.” More. 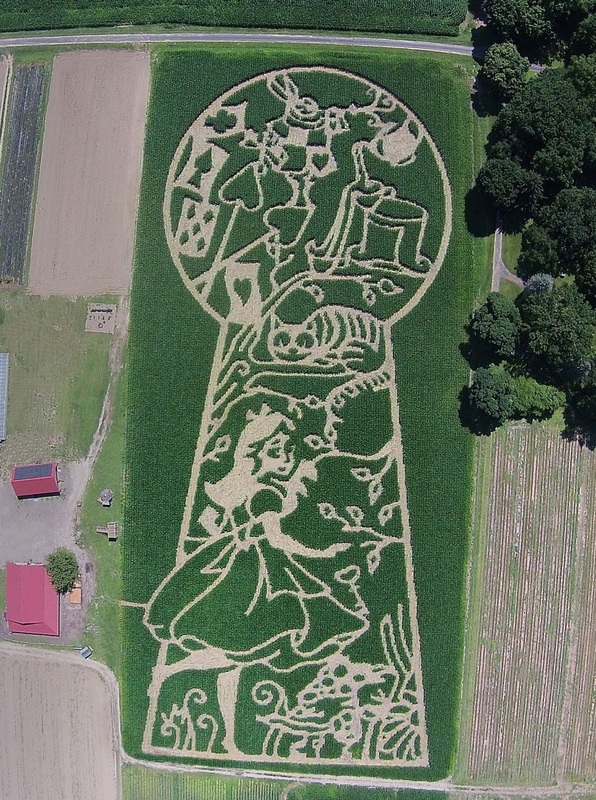 Aerial view of a corn maze commemorating the 150th year anniversary of Alice’s Adventures in Wonderland.